Dirk Longstreet (Gruner) is a school athletic coach and dog lover, and has the pride of knowing he has the most awesome name in town. His girlfriend Nicole (Harris) is a newspaper reporter, and her latest assignment is to find out the dark secrets of Ogden Correctional Institution. While there, she is attacked so badly she’s put into a coma. Dirk, with the help of Nicole’s editor Max (Lamas), working as his contact on the outside, decides to enter Ogden and get to the truth. But the corrupt guards are running Punchfighting matches, known as “The Circuit” - they even compete against other prisons’ illegal underground Punchfighting Circuits like it’s some kind of NCAA seed. But Dirk is an able fighter, and he’s going to have to be to take on the reigning champ, the evil Pike (Shagen). What will happen to Dirk - and what will happen to Nicole? We may never know! 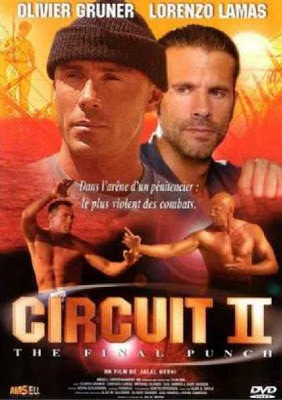 The Circuit 2: The Final Punch, whose subtitle contains the word “punch” which is a surprisingly rare thing, even for Punchfighters. It’s also surprising that there are actually THREE Circuit movies. Why? Can anyone answer this? Anyway, as you’ve already surmised, it’s a combination prison movie/Punchfighter, but it’s no In Hell (2003). Olivier Gruner (or is it Daniel Bernhardt, we can’t really tell anymore...) is fairly solid in the immortal role of Dirk Longstreet, but Lamas is underused here, even wasted. You can tell he doesn’t really care, but, in his defense, would you? But his “I don’t care” performance is actually appropriate and one of the better aspects of this movie. Besides the cheapness, unintentional “laffs” and out-and-out stupidity, which gets pretty grating after a while, there’s a certain dullness about the movie. Sure, it has a cool training sequence, but that’s just not enough. Even the scene where Chino XL and a bunch of his homies show up at the offices where Lamas works to say “we don’t like what you wrote about us” (hey, it’s plausible...doesn’t it happen all the time?) is funny, but we can’t really tell if it’s on purpose or not. Jalal Merhi, who’s in the movie for a few minutes (and literally phones in his performance) delivers, as a director, a movie with an amateurish structure. Plus you can’t really tell when the movie is from. Apparently it came out in 2002, but it seems mid-90’s. The second half of the movie is largely back-to-back fighting on the beach, strongly reminiscent of The Ultimate Game (2001). When J.D. Rifkin is your role model, there are some serious problems. As far as the “seedy jail” sequences, most of the major cliches are on show, such as the classic “prison speech” when the inmates first get to Ogden. The prison T-shirts have the name and number seemingly written-on in marker, and Michael Blanks, Billy’s brother who also appeared in Expect No Mercy (1995), plays the sympathetic friend to Dirk. But, Dirk doesn’t use his own name while in prison, presumably not to sully it, much like how a hand model always wears gloves. He goes by the name “Jim Morrison”. Presumably his first choice for a jailhouse moniker, Engelbert Humperdinck, was already taken. In all, even though the cast is solid, the dumb and dingy Circuit 2 is not. It’s not offensively horrible, but we still felt kind of bad for Lamas and Gruner (and pretty much everyone else), because they should be involved with better projects. Did we mention Gruner’s name in the movie is Dirk Longstreet? Also check out reviews by our buddies, The Video Vacuum and DTVC! 2 stars is being generous, this film was a total bore, even Gruner couldn't save it, i'm just glad part 3 never got an official release in the U.S.
Dirk Longstreet. Sounds like something out of a 90s scrolling beat 'em up. Important question: is the final punch of the movie something epic? Like super powerful and in ultra slow motion. Or is it just a regular punch? Venom: Lamas was the best part...his fight with the homies raised the star rating. Jack: Haha, Spot-on observation. If they added a character to Streets Of Rage 4, his name would be Dirk Longstreet. Unfortunately, it's just a regular punch. Not epic at all. The Bruce Li flick, Ninja Strikes Back has an epic punch. Is that the one where he rips out Hwang Jang Lee's ribs! I think so. It co-stars "Oddjob" from the bond movies. Definitely worth seeing.